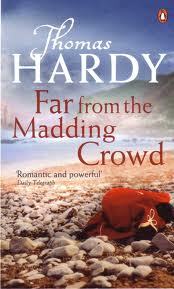 The Book Far from the Madding Crowd is written by Thomas Hardy in English and here it is available in PDF format. Before publishing this novel Thomas Hardy had already published several average successful novels, but in the early seventies of the nineteenth century Thomas Hardy was approached by the editor of Cornhill, a good and well known magazine of that time, actually he wanted to ask him to write a story to run in serial form. Far from the Madding Crowd came into the fiction as a resulting book of that conversation, it was the considered the best book of the writer an was a popular attraction for the magazine and Hardy’s first main success. It was first published in serial form in Cornhill magazine, and then was published the same year in UK in book form. At that time Hardy had already published many novels, but this was the first of the five novels that would assure and cleared his place in the annals of literature. The plot of Far from the Madding Crowd concerns a young woman, Bathsheba Everdene, and the three men in her life, this novel is very interesting and once you start reading it the you will never put that down before finishing it.